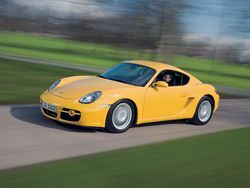 The new version Cayman - 2007 Porsche Cayman a mid-engine sports coupe is based on the Boxster series, the two-seater is powered by a six-cylinder boxer engine with an engine-capacity of 2.7 liters and 245 bhp (180 kW). With its high and sustained propulsive power in the lower and medium speed ranges, the engine puts in an impressive performance. It has a top speed of 258 kilometers per hour. This sports car with manual transmission accelerates from 0 to 100 km/h in 6.1 seconds. The Cayman is convincing proof of the fact that outstanding performance statistics do not necessarily mean high fuel consumption. According to European standards, it consumes on average only 9.3 liters per 100 kilometers, best in luxury class. The 2007 Cayman S has manual transmission and zips from 0 to 62 mph in 6.1 seconds. Acceleration 0-62 mph 6.1 sec. Thanks to the Porsche VarioCam Plus system the Cayman affords a torque of 273 Newton meters available between 4,600 and 6,000 revs. Power is transmitted via a five-speed manual transmission with short, precise shifting travel. A six-speed manual transmission in conjunction with the Porsche Active Suspension Management (PASM) system is also available on request. As a third variant, Porsche offers its customers the well-known Tiptronic S five-speed automatic transmission, which has rocker switches in the steering-wheel spokes for sporty gear shifting. The Cayman coasts along on 17-inch light-alloy wheels boasting a unique design with five double spokes. 205/55 tires are fitted as standard onto 6.5-inch wide wheel rims at the front; the combination at the rear is 235/50 tires on 8-inch rims. With the Porsche Stability Management (PSM) system fitted as standard, the chassis makes an impressive impact in terms of driving dynamics and active safety. Front Brake Size: 12.001 in | 304.8 mm. Rear Brake Size: 11.001 in | 279.4 mm. In additional to two full-size airbags to guarantee the necessary level of safety protection in the event of head-on collisions, the ingenious Porsche Side Impact Protection System (POSIP), which features a chest and head airbag on each side of the vehicle, also provides excellent protection in side-on collisions. Other special features of the Cayman are black brake calipers, black front-spoiler lips, a titanium-colored logo at the rear and also a trapezoidal tailpipe. The impressive interior boasts a comprehensive range of standard features including an air-conditioning system, a radio/CD player, seat covers in luxurious Alcantara leather, black-faced instrument dials and door entry trims with the Cayman logo. Because of the mid-engine concept, it boasts two trunk compartments with a combined volume of 410 liters, just like its big brother, the Cayman S. Along with many other storage features, this design highlights the sports coupé’s supreme practicality. The market launch in Europe and the USA will take place on July 29, 2006. The basic price in euros for the Cayman is 40,900 euros. In Germany, the vehicle costs 47,647 euros including sales tax and country-specific requirements. The Cayman will be on sale in the USA for 49,400 dollars (not including tax).